It’s been almost 3 years since the last version of Microsoft’s productivity suite was made available to the general public, and just like it’s been for the past decade or so, Office still remains the undisputed best in productivity suites. Office 2016 represents a lot of the new direction Microsoft is heading in, which is mobile and cloud first. On the surface it doesn’t look like much has changed, but underneath, there’s a whole host of new features. 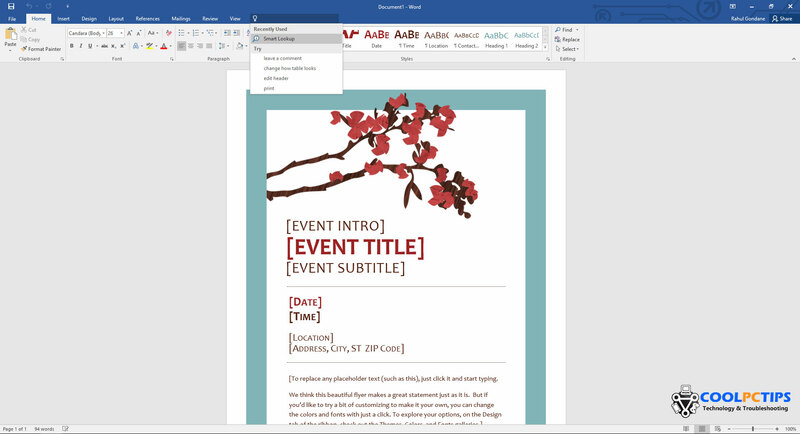 The completely different look that came with Office 2013 has just been fine tuned here, so if you’ve been using the Office apps on mobile devices, you’ll notice how the UI now seems consistent across platforms. But is it worth the investment? Microsoft Office 2016 Review – What’s New? 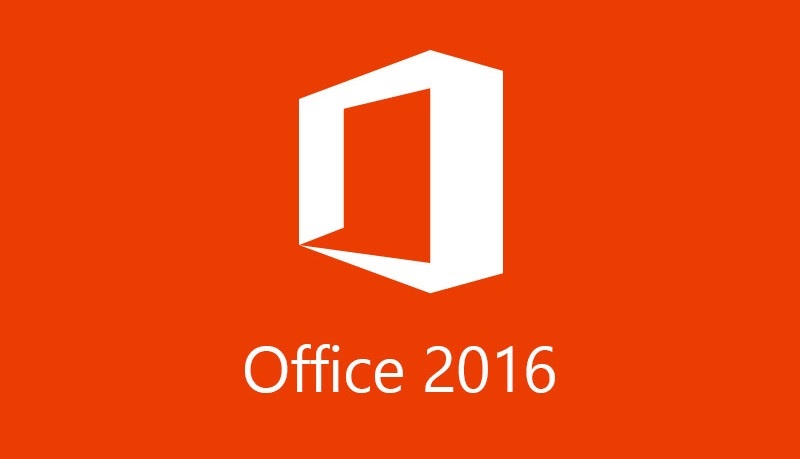 Office 2016 is the first version that embraces the cloud fully. The very first thing you might notice when you fire up a program from the suite will probably be the ‘Share’ button on the top right. It allows you to share the file with any collaborators so that you can work in real time. It’s a much welcome feature that has been in Office 365 since a while, and now makes its way to the offline suite. All collaboration can be done seamlessly in real time, so you can have multiple people working on a document at once. 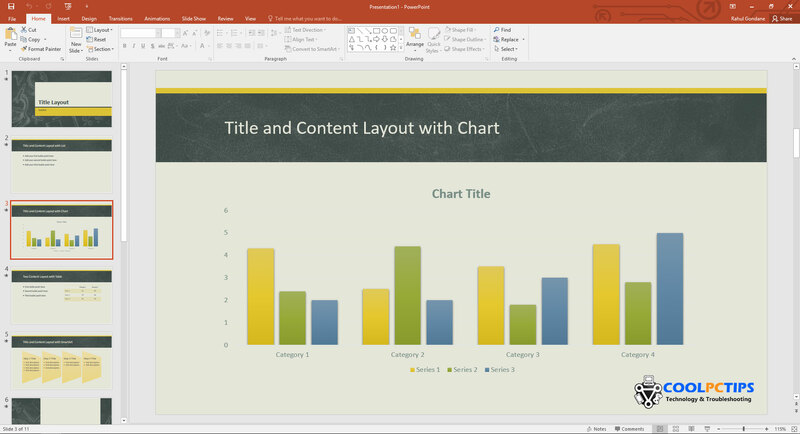 It works best on Word as of now, but seamless PowerPoint, then Excel support coming in a few months. You’ll also probably notice the search bar on the top ribbon with a little bulb that says ‘Tell me what you want to do’. Upon clicking, it shows a drop down list of some of the most common queries, which you can then click to get a contextualized menu related to what you wanted to do. You can also search for your query and the program will display a list of solutions. As mentioned earlier, the UI hasn’t changed much, but there are a few touches here and there that make it look much better. For example, every program now gets a colored top bar according to its theme, as in blue for Word, orange for PowerPoint and so on. You can, however opt for different colors depending on preference. Another welcome addition is the integrated ‘Smart Lookup’ feature. You can now highlight and search for terms and phrases directly in the program, which makes working with internet support far easier. For example, if you want to search for ‘Microsoft’, simply highlight the word and you can get information about it in a panel that appears on the right side. If needed, you can click on the links and expand it into your browser as well. This, of course, is powered by Bing. Skype is also better integrated into the whole suite, so you can start off a call or conference right within the program. The branding has also now been applied to what was formerly known as Lync. Now called Skype for Business, it combines features from the popular VoIP service with Lync. Outlook, the popular mail client has also picked up a few improvements apart from the common ones, most notably support for Office 365 groups, and a feature called Clutter. Office 365 groups allow you to have all your shared resources, including inboxes, calendars and notebooks displaying seamlessly. Clutter is a new feature that over time, learns your behavior and understands what mails you read, and what mails you ignore. It also automatically categorizes spam, promotions, social media updates and other low priority stuff, and moves it to a folder called clutter. So you’re basically left only with important mails you really could use, instead of an inbox full or relevant yet useless, or irrelevant and useless mail. The clutter folder acts something like a filter, so it’s up to you to clear it periodically, like a spam folder. This feature can also be disabled though. In general, Outlook has also gotten smarter, and offers options to attach a recently used file or folder, both from local disk or OneDrive, with OneDrive links and permissions being generated automatically. Each program also gets their share of new templates, charts and whatever else they work with, with new designs and layouts available by default. As always, online templates will also be available, and Microsoft is looking to expand their library over the years. Access and Publisher, however, remain largely unchanged, and get only the new UI and common features like Tell Me. But that’s not all, there’s actually some new additions to the Office family, called Sway, Delve and Planner. Sway is perhaps the most interesting new addition to the lineup, and can be most accurately described as a combination of Word and PowerPoint. It’s a presentation app that’s completely free, and usable on both desktop and mobile devices. You can create interactive webpage like presentations using written content, pictures, embedded video and more, usable across a wide range of devices. These ‘presentations’ function like individual interactive webpages, and are tied to your Microsoft Account. It can be viewed from there, or you could just upload it to Microsoft Docs, an online work sharing platform, and get a unique URL. 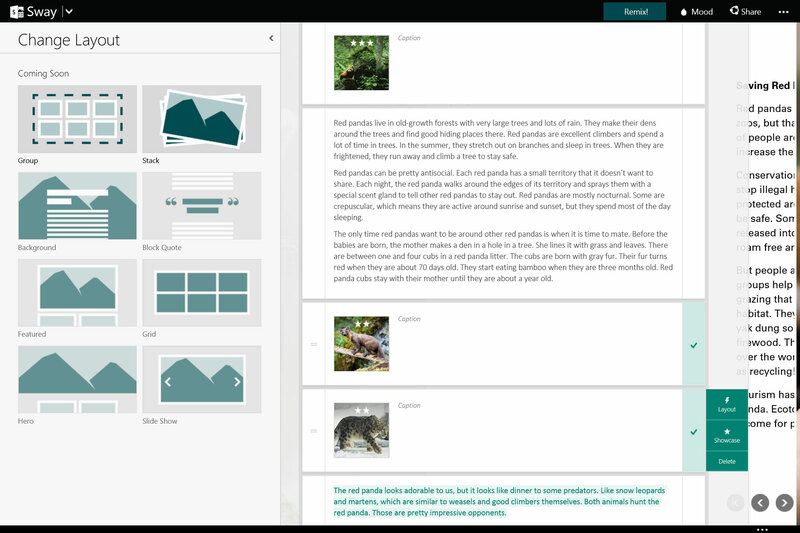 Sway is still in its infancy, but lets you create some really cool looking webpages/presentations with custom content in a matter of minutes. Delve is an online Pinterest like platform that helps connect projects and people in an organization. The graph like interface can be used to share regular updates or collaborate with a few clicks. It can also be called something of a limited social network, with profiles, specific details, work done together and the like. For example, there’s a list of people on the left apart from the regular public updates, from which you can click a person’s name and get to a profile with details about common projects, files shared, current work and more. Aimed at fostering more connection in the workplace, Delve is an interesting tool that might not find a home in many organizations, but is noteworthy nonetheless. Planner is exactly what it sounds like, a tool that lets you perform task and project management, with additional features. Since it’s obviously integrated into the whole Office suite and Microsoft services, organizations who’ve already adopted Microsoft’s productivity platform will find it much easier to work with. Planner gives you a glance of projects and tasks with deadline tracking, so you can understand immediately where problems are arising, and what’s lagging behind. This of course, will work best with teams that work collaboratively with project and task based breakdowns. For the others, it might not be as useful, but is still a damn fine tool. All in all, you probably won’t find a huge difference between the last release and this one, which can be both a good and bad thing. Good, because it’s familiar enough for any longtime Office user to jump into, and perhaps bad, because it might not justify the purchase. What it does do, however, is make Office a far more robust and consistent product across platforms. 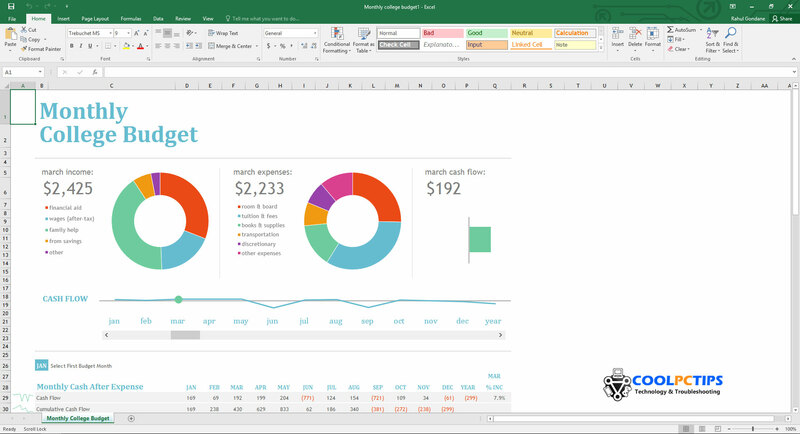 Microsoft’s push for one consistent experience seems to be heading in the right direction, and Office is all the better for it. They’ve promised quicker updates, more features being added periodically and more efficient security fixes. Office 365 subscribers will be the biggest winners, because they’re slated to get all updates and features first, over traditional perpetually licensed copies. Thanks for the valuable post and detailed article about Microsoft Office 2016. I am planning to upgrade office to 2016.Any major bugs found after updating to 2016? No bugs at all mate.